The Reidarson Group was started by Thomas Reidarson DVM to provide a unique service to marine facilities. Reidarson Group : Marine Animal Specialists can serve all your veterinary, nutritional, and water quality needs. 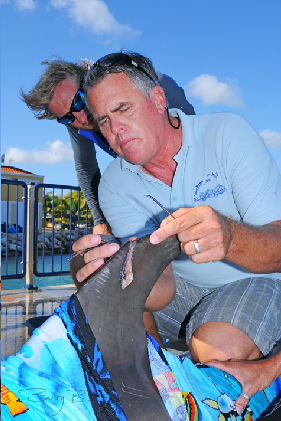 Working closely with a number of professional marine-mammal specialists in the fields of internal medicine, ophthalmology, reproductive physiology, nutrition, infectious diseases, water quality, and surgery, we are able to respond promptly to any issue with the appropriate expertise. Our long-term plan is to develop health and fitness programs of preventive care uniquely crafted around the needs of the facility. In our experience, routine diagnostic samples rarely identify subclinical illness, and when most animals present overt clinical illness it is frequently days or weeks after the true onset of the disease. For this reason, apart from routine quarterly blood, urine, blowhole and stool cytology, and complete ultrasound examinations, we incorporate a fitness plan that is designed to identify early signs of illness before even the most astute trainers detect changes in behavior.